ALP Future Class ocean-going AHT vessels are ideal for towing of very large floating objects. Image courtesy of alp maritime services bv. ALP Striker was floated out of dock in October 2015. Image courtesy of alp maritime services bv. An artist’s impression of the ALP Future Class towing and anchor handling tug. Image courtesy of Ulstein Group. ALP Striker is expected to be delivered in the first quarter of 2016. Image courtesy of Ulstein Group. ALP Future Class is a series of four next-generation, long-distance towing and anchor handling tugs (AHTs). 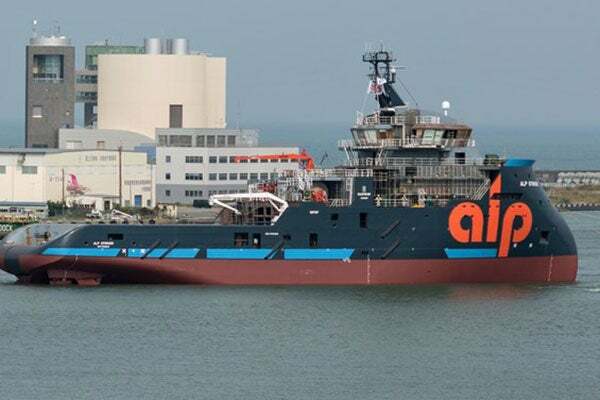 The tugs are being built by Niigata Shipbuilding & Repair for ALP Maritime Services (ALP), a subsidiary of Teekay Offshore Partners, and are based on the SX157 design from Ulstein Design & Solutions. ASD TUG 2913 is a new series of highly manoeuvrable and powerful azimuth stern drive (ASD) tugboats, offered by Damen Shipyards Group. The ocean-going AHT vessels are primarily designed to tow large, floating objects, such as oil rigs and floating production, storage and offloading (FPSO) units, over long distances. In March 2014, Ulstein was contracted by Niigata for the design and equipment package for four ALP Future Class AHTs. The first of four vessels, ALP Striker, was launched at Niigata shipyard in October 2015. It is scheduled to be delivered in the first quarter of 2016. The ALP Future Class incorporates Ulstein X-BOW© design, ensuring optimal seagoing characteristics in adverse weather and sea conditions. It develops sufficient bollard pull to avoid the need for a third vessel when towing heavy structures. The dual-role vessel comprises a fully integrated dynamic positioning Class II (DP II) system. It is classified by DNV with clean design and ice class 1B notations. The AHT also features passive roll reduction tanks, an incinerator, chilled water plants, a stationary compactor, six liferafts, a rescue boat and a work boat. The vessel is 88.9m-long and 21m-wide, and has a deadweight of approximately 4,250t. It offers a cargo deck area of 550m². The deck is fitted with a Rolls Royce SL400-3T towing winch, three drums, storage reels, a fibre-rope storage drum and two cable lifters. The winch on the towing drum’s first layer has a holding load of 675t. Other towing equipment aboard the vessel include a stern roller, two Rolls Royce gog winches, two hydraulic capstans, a tugger winch, two sets of tow pins, hydraulic raised/lowered vertical towing guide pin sets and two karmforks. The AHT vessel is installed with X and S-Band ARPA radars, a chart radar, an electronic chart display and information system (ECDIS), two differential global positioning systems (DGPSs), a navigation echo-sounder, a doppler speed log, three gyro compasses, a magnetic compass, an automatic identification system (AIS), a voyage data recorder (VDR), a sound reception system (SRS), and a bridge central alarm system (BCAS). Communication systems include two MF/HF 150W DSC radio stations, a GMDSS power system, two GMDSS alarm panels, a navtex, two radar transponders/AIS transponders, three portable GMDSS VHF units, two SatCom-C units, a ship security alert system, a long-range identification tracking (LRIT) system and fixed / portable VHF sets. The Future Class offers 27 single cabins for officers and crew members. Also included are 35 berths, a provision room, a vegetable room, a meat room, and entertainment facilities for crew and officers onboard. The power plant integrates four MAK main diesel engines driving two CPP 5,000mm propellers. Each engine develops a power of 18,000kW at 600rpm. The vessel is also equipped with flap-type rudders, two 1,500kW bow thrusters and two 1,050kW stern thrusters. Power is supplied by three 940ekW auxiliary generator sets and one 200ekW emergency generator set. The propulsion system provides a bollard pull of 306t and a maximum speed of 19k. The vessel has a fuel capacity of 3,500t. This allows it to sail non-stop towing voyages across the Atlantic, Indian or Pacific Oceans for up to 45 days, without refuelling. SKW Marine Equipment is a fast growing ship-repairing service provider and deck machinery manufacturer that offers operational and engineering solutions to the marine and offshore industry.